Perhaps it is the fact that she never fired a shot in anger, or that she is not associated with any world renowned name, or even that her presence in Portsmouth owed as much to commerce as emotion, but probably it is a combination of all three and more that have deprived HMS Warrior of the affection so easily found for her sister ships HMS Victory and the Mary Rose. Perhaps this will change with time, as she is undoubtedly a vessel worthy of her place at the heart of the nation's maritime history. In the 1850s the navy's need for a ship of Warrior's capability originated not in the foresightedness of the Admiralty but in the fear that France was getting the edge when it came to warship design. Britain's ships had reigned over the oceans of the world without having to fight a major battle for nearly half a century, but it had done so using wooden ships mostly designed in the 18C. The ships had altered little, apart from the gradual adoption of steam power and the use of propellers, but the advance in armaments was changing the whole nature of warfare at sea. The days when ships sat a few feet apart firing volley after volley at point blank range were fast disappearing as new guns, manned by trained gunners could fire accurately over 1000s of yards. The French were the first to thoroughly address the problem and set about building La Gloire, a vessel of 5630 tonnes displacement and 255ft in length, powered by both steam and sail giving a top speed of 13 knots and armed with 36 × 163 mm rifled muzzle-loaders. Though formidable in many respects the French declined to use an iron hull, opting instead for wood with over 4ins of armour plating. She was laid down in 1858 and set a marker for the British, Russian and American navies. Britain had previously carried out tests on new designs but it wasn't until Sir John Pakington became First Lord of the Admiralty in 1858 that events took a more urgent course, spurred on to some degree by Prince Albert who wrote, "What have we got to meet this new engine of war?". The Admiralty responded by convening a Board meeting on 26th November 1858, the outcome of which was the commissioning of an iron hulled frigate of over 8000 tonnes displacement with 34 guns on the main deck, 1000 horsepower engines and a top speed of 14 knots. Designs for two new ships were invited and fifteen were received, 6 from master shipwrights at HM Dockyards and the rest from private yards. The design by Naval Architect Isaac Watts was accepted in April 1859 and the contract for building the ship went to Thames Ironworks and Shipbuilding who began work in May 1859. As with any large innovative project there were frequent delays and changes of design but news that La Gloire had been launched in November 1859 lent impetus to the work. Even so, a full year went by before the launch could be considered, but on December 29th 1860 Sir John Pakington, in the presence of a suitable gathering of senior Naval Officers and members of both houses of Parliament, named the ship HMS Warrior. For a few minutes she remained motionless then, imperceptibly at first she slid down the slipway into the water. Fitting out the ship would take another seven months during which time the engineers had to cope with problems never previously encountered in constructing a warship designed to sail under either steam or sail, such as the need to install a mechanism to raise and lower the funnels and propeller, features that would be needed as the ship's propulsion changed from steam to sail power. With the launch approaching the Admiralty's collective mind turned to the matter of who should command the new vessel. On 31st May 1861 they informed Captain the Honourable A.A. Cochrane that he was their choice. Being the third son of Admiral Thomas Cochrane, one of the most renowned of 19C sailors, would not have hindered his selection, but in fact his appointment was based solely on merit. One of Cochrane's first acts was to select the 29 year old George Tryon as his Commander and together they visited the ship on a regular basis. On Thursday, August 1st, HMS Warrior was formerly commissioned into the Royal Navy and a week later, with half the crew on board she raised steam and set out on the short journey down the Thames to Greenhithe where she would complete her fitting out. On Thursday 19th September 1861 HMS Warrior set sail for Portsmouth, arriving there the next day. Final preparations for the ship's first sea trial, including the application of a new coat of paint, then began in ernest and on October 10th she left her berth and headed out to Spithead and beyond. In the first trial Warrior attained a speed of 12½ knots and with wind and sea astern raised this by a further ½ knot. It was looking good; the next test would be a voyage to Queenstown in Ireland for a trial in open sea. Further test continued until November 23rd when Warrior ran for nine hours at full speed during which she reached a speed of 17½ knots. It was time to join the action. In January 1862 Warrior set sail for Lisbon encountering on the way a fierce storm which she weathered to Cochrane's great satisfaction. In March the ship moored in the Hamoaze off Devonport where she remained for three months whilst repairs and modifications were carried out. For much of the next year Warrior was accompanied by her sister ship Black Prince as together they came to understand the best way of handling these modern warships. In April a young gunnery lieutenant named John Fisher joined Warrior. He was to have a long and illustrious career ending up as First Sea Lord. Warrior then went in for a lengthy refit, to emerge on 1st July 1867, just in time to lead a Fleet Review in Spithead before Queen Victoria and the Sultan of Turkey. On July 25th Warrior's new captain, Henry Boys commissioned her for the second time, and in September that year she joined the Channel Squadron at Queenstown and sailed for Lisbon. For the next four years the ship alternated periods of service with the Channel Squadron with visits to dockyards for repairs and refits until on September 15 1871 she was paid off at Portsmouth. For ten years Warrior had led the development of the ironclad battleships but without major modification she had been superceded by new generations of warship and was now relegated to the Coastguard service. 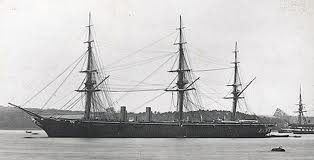 Her sailing days were not yet over though as she continued to serve for a further 12 years before being paid off for the last time at Portsmouth on 31 May 1883. Warrior's future was discussed on many occasions over the ensuing years whilst the ship herself waited quietly in Portsmouth Harbour. By the end of the century she was a derelict hulk and if it hadn't been for the development of new forms of warfare she would almost certainly have been scrapped. The idea of using a torpedo to attack a ship had been around for a few decades before it was decided that the navy needed a new school devoted to the training of specialists in it's use. It was decided to attach this schoool to the naval gunnery establishment at HMS Excellent then based on a hulk moored to the north of Portsmouth dockyard. The torpedo training was to be carried out aboard another hulk, formerly HMS Vernon, to which other hulks were added including, in 1904, Warrior, renamed Vernon III. Thus began another phase of the old ship's life which lasted for 15 years until the Torpedo and Mining school moved to Gunwharf. Once again Warrior's future looked bleak. For another ten years Warrior lay idle in Portsmouth Harbour until in 1929 she was sold as a floating jetty off the Llannion fuel depot near Pembroke Dock. There she remained for over 30 years, quietly resisting the ravages of time whilst many later ships were scrapped until in 1960 she was the last of the ships built between 1861 and 1877 still afloat. Surveys of her structure at this time revealed that she had been so well constructed that she could easily survive another 30 years and the first murmurings of restoring the vessel began to surface. By 1968 some very senior people, including the Duke of Edinburgh, were meeting to actively discuss the preservation of Warrior. Many schemes for the restoration work and public display were discussed until in 1979 Warrior was officially passed to the newly formed Maritime Trust and towed to Hartlepool with an eventual destination of Portsmouth, which had won the bid to berth her over Newham who wanted place her in the Thames, not far from her launch site. The Ships Preservation Trust took on a five year lease of the ship whilst responsibility for carrying out the reconstruction work would lie with Locomotion Enterprises. 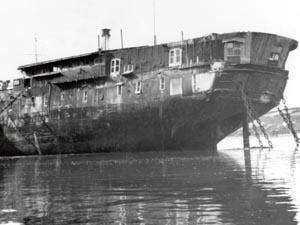 An initial survey discovered that the ship would require a complete re-fitting as there was almost nothing left inside the hull that dated from before the end of the second or third commission. A formidable challenge. There followed a period of intense research into the original contents of the ship, from the guns and the engine to the hammocks and the waterbuckets; even Arthur Cochrane's archive was located in Ireland which contained many original documents and drawings. Whilst the restoration project was underway at Hartlepool, Portsmouth City Council was considering how Warrior was to be displayed. She was plainly destined to become a part of the Historic Dockyard but there was nowhere close to the other ships that she could be berthed. Eventually it was decided that a special jetty should be provided for her on the south side of the dockyard, in front of the Hard. In order to prepare the berth a trench 26 feet deep had to be dredged alongside the jetty. By mid-June 1987 all was ready to receive the restored vessel which was towed the 384 miles from Hartlepool to her new home, and though her name may not be quite as familiar as Victory or Mary Rose she was most certainly the first modern battleship and now that she is alone, she will remain the last battleship afloat.